Monk was born in Rocky Mount, North Carolina in 1917, but soon moved to Manhattan, where the primordial elements of jazz music–ragtime, blues, swing–were simmering. In the 1920’s, the rebellious and sensual nature of Jazz music was perfectly suited as a soundtrack for the illicit nightscape of Prohibition era America, offering a release from the tempered conservatism prevailing in law and social convention. As the house pianist at Minton’s Playhouse in the early 1940’s, Thelonious Monk conceived the foundation of his style with the inspiration of some of his fellow musicians, a group which included Dizzy Gillespie, Charlie Parker, and later, Miles Davis. At a time when musicians practiced active creative thievery–the incorporation of heard sounds into their own compositions–these artists sought a style which was impossible to recreate or mimic. And so bebop was born from necessity, spontaneity, and zeal. Monk went on to record with many of the great jazz musicians of history–Coleman Hawkins, Sonny Rollins, Art Blakey, John Coltrane, and so forth. His discography also attests to his perpetual globetrotting with releases such as Monk in France, Thelonious Monk in Italy, and Monk in Tokyo. By the mid-1970’s, however, Monk had disappeared from the scene. Some attribute his decline into creative dormancy to mental illness, perhaps caused by schizophrenia or even a misdiagnosis and incorrect prescription, which some believe might have caused permanent and severe brain damage. 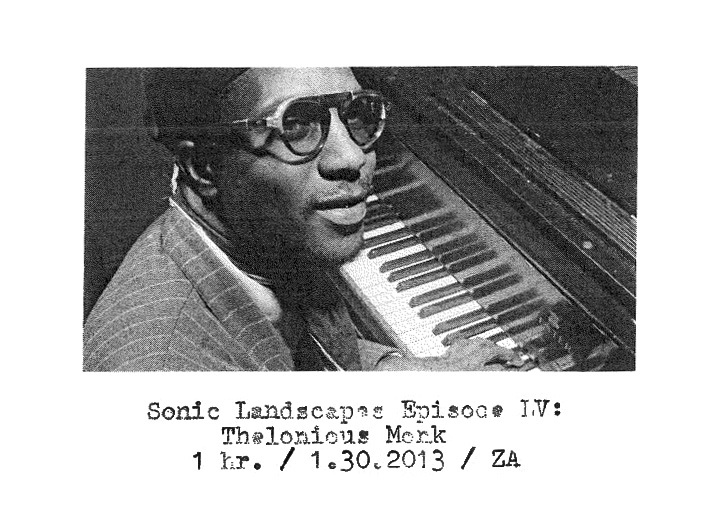 In this episode of Sonic Landscapes we explore this incredible artist chronologically, from his early recordings on Blue Note Records to his later works on Columbia. The episode ends with a tribute to Monk by legendary hip hop producer J Dilla on Common’s album Like Water For Chocolate, a testament to Monk’s enduring influence beyond the realm of the genre that he helped craft.